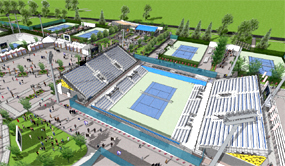 Cincy: a more compact Indian Wells in the midwestern summer? Unless you were actually from Cincinnati, you might have no idea what a huge tennis town it really is. These guys were playing team matches versus England before Davis Cup. That's serious. 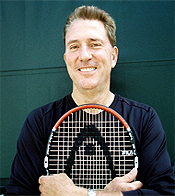 There are over a dozen well-established clubs, and the interclub play there has been around so long and is so big and important that it's probably the only city in the country where it dwarfs the USTA leagues. Again, unless you knew, it might also seem odd that Cincinnati has the third Masters event in the states in addition to the better known, larger events in Indian Wells and Miami. Not Los Angeles, or Chicago, or Dallas, or even San Francisco. Cincinnati. But when you get to Cincy, see what a big deal the event is in the community, see how numerous and avid the fans are--well, you start to understand. A couple of years ago we published a video documentary on the secret tennis life of Cincinnati. If you haven't checked it out before, it's worth it. The bottom line is Cincy is a great event and is only going to get bigger and better known. So why not jump in now closer to rather than further from the ground floor? is the tennis town it really is. And hey, I'm from the Midwest originally, and I appreciate the fact that everyone is just so damn friendly. This year though there is a lot of new stuff to appreciate. Because this year, Cincy, now partially owned by the USTA, is a combined men's and women's event, all over a week period. That's correct, just like Indian Wells and Miami. So there is a lot worth filming and analyzing. All the top men and all the top women. In the smallest and most intimate venue for that in the world. 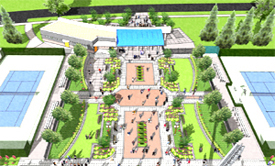 A new television court and a new plaza for 2011. But it's not just the event that has evolved. The entire facility is also being reshaped. 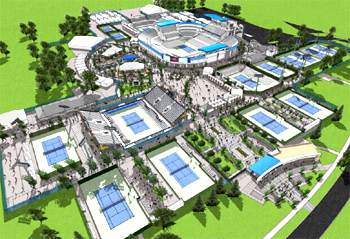 It'll be expanded by about 5 acres and that will mean six new courts, and a new ticket office and entry plaza. There will be a third TV court with a seating capacity of 4,000, and a fourth court with a capacity of 2,500. That goes with the giant new media center they added last year on the main stadium. Hey they'll never recreate the spring desert weather at Indian Wells. In fact you better to ready for some serious midwestern heat and humidity--not to mention some amazing summer thunderstorms. So that's different, but in some ways it looks like Cincy is on it's way to becoming a sort of mini-Indian Wells tennis destination event. Can't wait to see how it all looks. One thing that is also a little different in Cincy, well the event isn't really in Cincy. It's in a place called Mason, Ohio. That's about 30 to 45 minutes from anything that looks like Cinncinati to me. Be that all as it may downtown Cincy does have its charms. It a small, intimate downtown, with one really great old hotel, The Cincinnatian. And a couple of great steak house's, my favorite being Jeff Ruby's. A surprising French find: Jean Robert's Table. 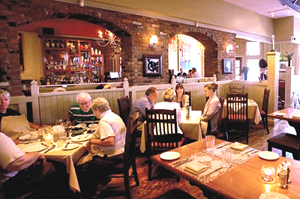 But the big surprise is the amazing French restaurant called Jean Robert's Table. (Click Here). John Robert is quite a character with an interesting life story (Click Here) and he likes to mingle with the patrons and doesn't shy away from a glass or wine, or two. He also cooks a very exclusive private dinner for Federer and the tour powerboys and sponsors at a huge private estate before the tourney. But more relevant in my view is that his food is amazing--and that's coming from someone who loves the good French restaurants in San Francisco. It's a relatively small intimate place with a cool bar scene. We went then a totally excessive three times last year. Don't forget to bring your credit card with the highest limit, but I think this place is worth it. 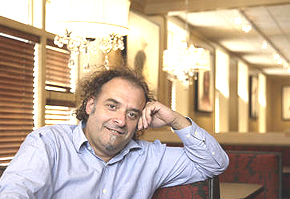 Personally I am expecting our Cincinnati based team member Michael Kindred to pick up the tab including a few bottles of good French wine during our dining experiences there. He sold his high rise condo overlooking 8 tennis courts and the Cincy pro sports stadiums where we stayed last year and that was very selfish of him. I guess I have to try to forgive him since he's really good with the buggy software that runs that incredible high speed camera. So yeah, in case it's not obvious, I am recommending this event! It might be closer for you than Indian Wells. Or maybe you are just up for a little adventure in the Ohio summer countryside. Just get ready for the heat--and maybe join all those fans I see drinking giant beers in the stands. Send me an email if you plan to be around the grounds. Or maybe I'll see you at Jean Robert's.